When Marie and I were deciding on the setting for our book series we knew for sure it should be Louisiana. First of all, we know it. As children, we lived across the street from each other in Vidalia, a small central Louisiana town. We played on the levee together and made ‘club houses’ in the brush at its base. We went fishing in the Bar Pits, and dredged the back ditch behind Marie’s house for crawfish after every big rain. And when we were old enough to drive, we drove the back roads at night singing at the top of our lungs to Wilson Phillips or Tracy Bonham. Both of us went to college in Louisiana. I went to Tech in Ruston, and Marie, to Baton Rouge and LSU. This state is in our blood, and more than that, our hearts. So when we were talking about where in the world The Waiting would be set….Marie said, “why not New Orleans?” And so, New Orleans it was! We went a step further by accident, and somehow included all of South Louisiana. It has been a joy researching and exploring that part of my state. From Darrow to St. Amant, Slidell, Mandeville, Bayou Des Allemands, and especially New Orleans, I have gained such an appreciation for our heritage as native Louisianians. So here are a few pictures of the past two trips I’ve taken to South Louisiana – most of these places are significant in Book One, and if not Book One, Book Two and so on. 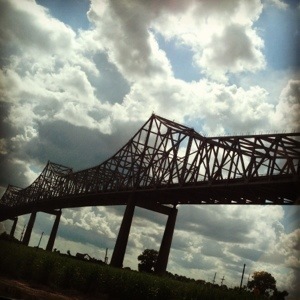 ← On the Banks of the Pontchartrain – Part 2….